Gardening is a pastime appreciated by many, but what if tight quarters keep you from a sprawling green garden? 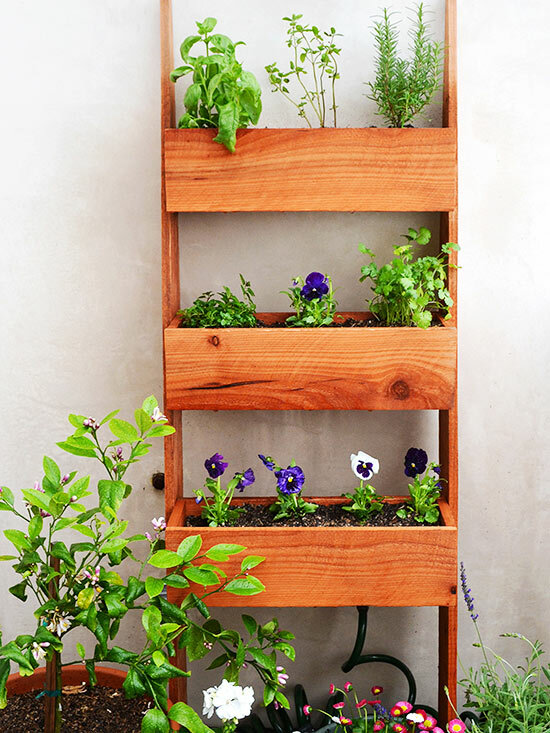 It’s time to start thinking vertically when it comes to your gardening projects this season, and — lucky for you and your green thumb — the options for executing your new vertical garden only go up from here! 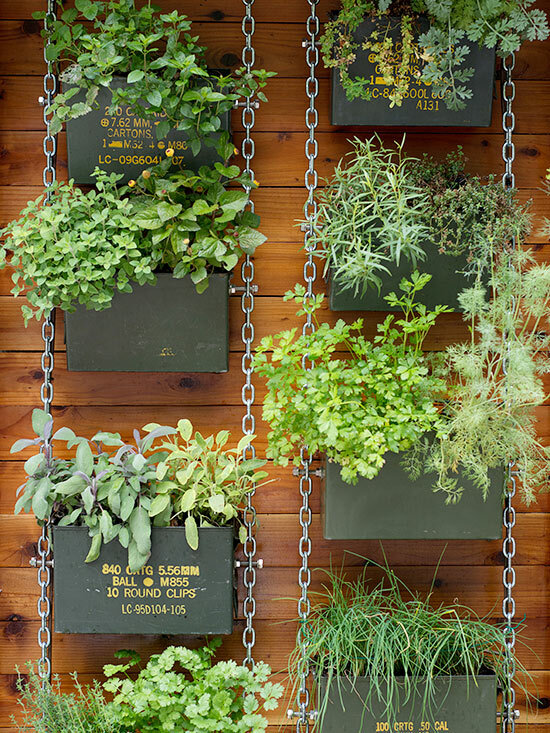 Get inspired by these clever vertical garden ideas. 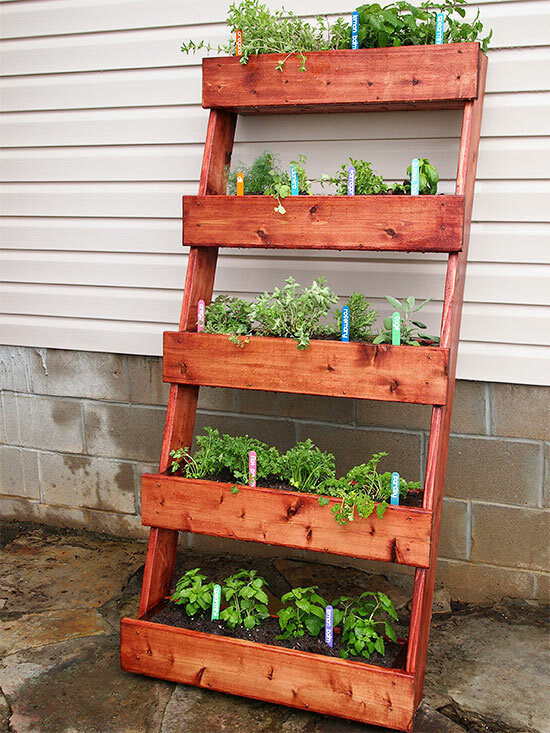 Here’s one project that proves that you can use virtually any type of vessel to create vertical garden herb planters. This gardener repurposed a set of old metal ammo boxes for his artistic floor-to-ceiling garden. Make your own by pre-measuring and drilling holes into the sides of your boxes. Then string lengths of chain along opposite ends of the boxes and attach with bolts before hanging on an exterior wall. These lightweight cylinders are the perfect solution for gardeners grappling with pint-size square footage. They can be grouped together or left as solo planters. They’re both ground-friendly and able to be hung vertically, as shown here. When planted with a variety of succulents and greenery, they are a work of art! Think fences are just for creating a perimeter around your garden? Think again! Here, standard redwood fence posts were reimagined to create a ladder-form vertical flower garden that suits the tightest of spaces. Make your own by measuring and cutting the posts to your preferred height, then measure, cut, and drill smaller wood pieces together to create boxes. Screw the boxes into the fence posts and fill with soil, fertilizer, and plants. To re-create this roped wooden shelf garden, measure and cut the wood, then drill pilot holes and larger holes for the pots to sink into. Drill holes on the exterior corners for the rope to slip through. Sand the boards, then string them together. Use zip ties to ensure an even height between each shelf. Set your potted plants in place and enjoy. 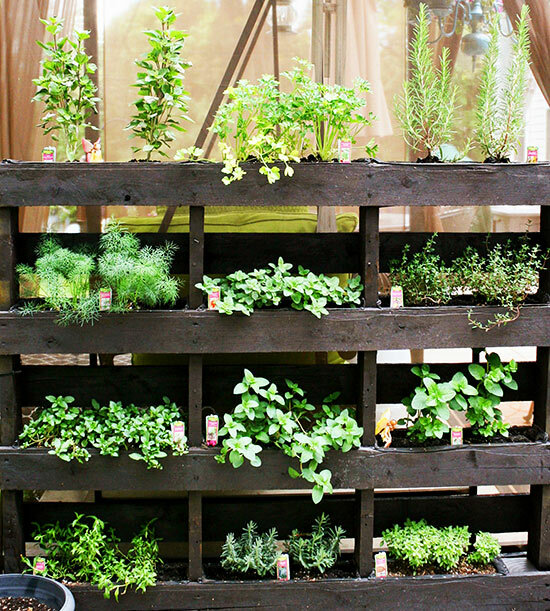 Believe it or not, this freestanding vertical garden was crafted using a leftover wooden shipping pallet! To re-create on your ownpatio, wash your pallet with bleach and sand it down, then add a wood frame at the bottom to attach to the ground supports. Stain the wood and staple a fabric weed barrier between each shelf. Fill with soil and plant herbs or flowers. 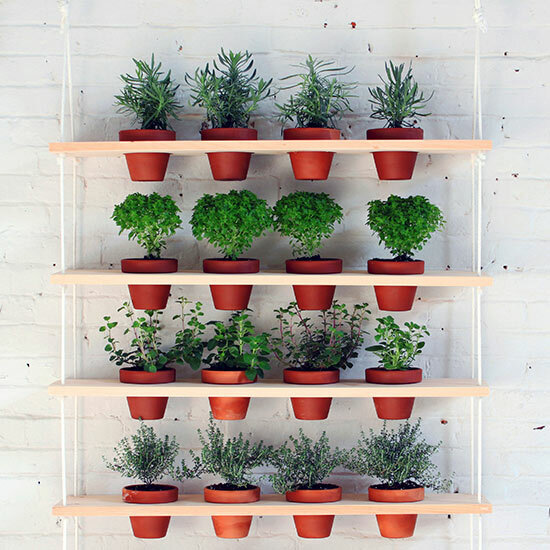 This DIY leaning herb garden is as pretty as it is functional! To make, measure and cut your wood, then assemble the boxes using a drill and wood screws. Miter the two supporting wood sides to suit your preferred angle and attach the boxes using more screws. Stain the outside of the boxes, then fill with your favorite herbs and flowers. An oversize, wall-mounted coatrack is the perfect solution for an indoor vertical garden. 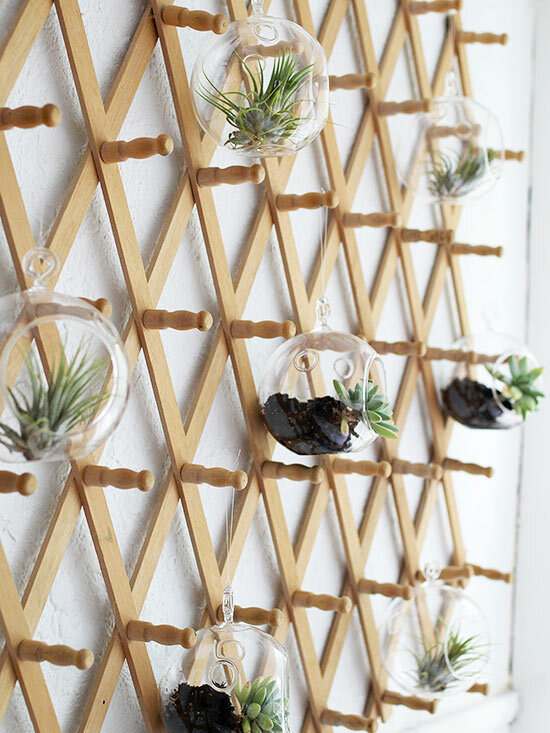 Simply repurpose the hooks by hanging it on the wall, then hang terrariums right over the pegs. Depending on the plants you choose, be sure to install your coatrack within a properly lit environment — for example, beside a window or set of French doors. 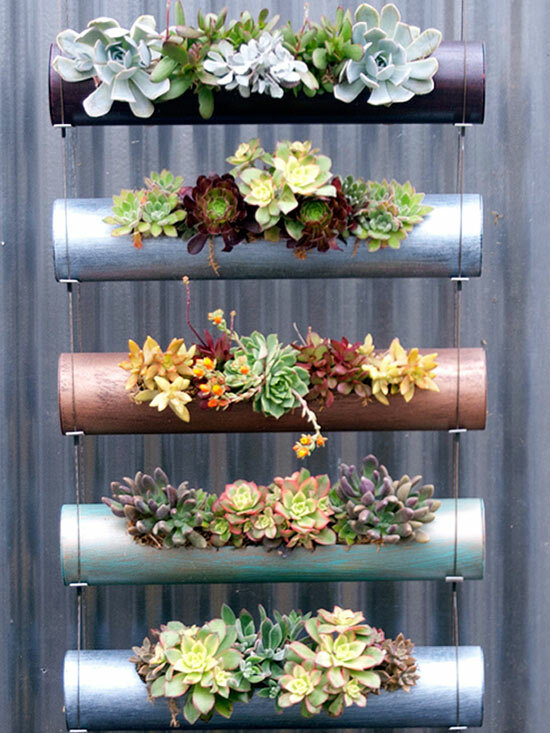 Before tossing old paint cans, give them a second life as a DIY vertical garden. Here’s how: Use wood screws to attach metal cleats to wooden boards, and mount boards on your chosen exterior wall. Then, mask off areas of clean, dry, label-less paint cans and spray-paint them with a bright accent color. Remove the tape, let the paint dry, drill holes into the sides of the cans, and knot lengths of rope through the holes. 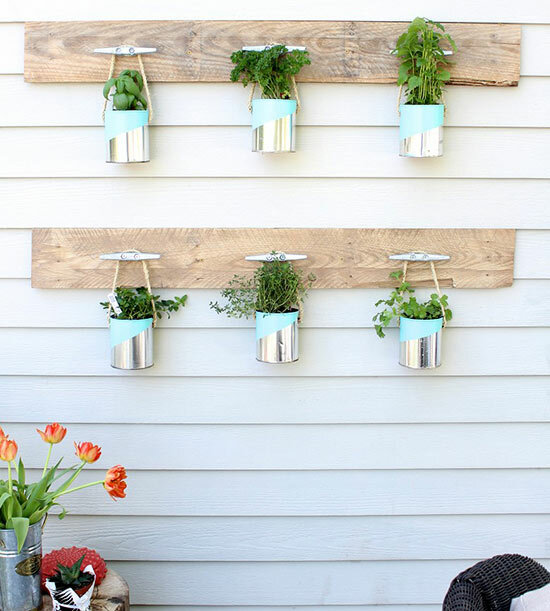 Finish by hanging the pots from the cleats on the wooden supports, and plant your favorite herbs.